The steel surface of precise gears after heat treatment are ground by using ISO 6(DIN 6) or AGMA 12. The tooth profile is effectively modified through professional technology to achieve highly efficient operation. Shaft is designed with the ability to accommodate bend intensity and torsion loads within the specifications. It is made with steel surface after heat treatment in order to make it operate smoothly and lastingly. The deflection of the shaft is precisely calculated and properly modified to enable the gear wheel to engage with the gear shaft while loading. Both the input and output shaft sealing areas are specifically ground and hardened to make an effective and leakage-free sealing surface between the seal’s lip and the shafts. We carefully select the suitable housing materials (cast iron) to fit application requirement. For example, a fitting gear is made by accurate machining. It allows horizontal, vertical or upright mounting to suit the confines. Also, six direction oil holes within the interior of the housing are designed for easy oil filling/ drainage. Lasting sealing material is chosen to use. Premium seal is also available for high temperature and corrosive environment. IEC-standard electrical motors can be supplied together with the gear box, and we also offer various voltages to suit every region. 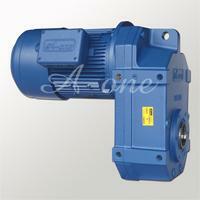 Besides, other brands of electrical motors also can use it as long as the motors accord with IEC-standard. Modular concept motor flanges also allow cooling fans to be equipped within the flanges. The Fan design is a basic assembly within the motor. In addition, the special fan design for cooling system is available. Emergency stop brakes for operation are ideal. 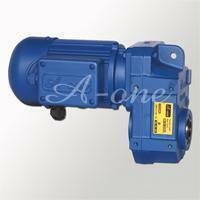 The safe brakes are used whenever a constant brake torque is in utmost operation. Motor flanges are designed so that any IEC-motor between 63 and 132M can be combined with any gear boxes. Motor flanges for size 63, 71, 80, 90, 100, 112, 132 are fitted with the housing of the gear box through a modular flange adapter. The gear box can be equipped with a standard mounting flange for easily mounting onto the drive. If required, special flanges also can be customized according to customer specifications.